How to Export iPhone Videos with Encryption? How to Export iPhone Videos to Windows 10/Mac with Encryption? Here's the case: whenever you need to upload iPhone videos to Cloud storage, use its on SNS websites like Facebook, Musical.ly, Snapchat or so, you go with the risk that the Cloud storage host or SNS developer taking the advantage of users' data for commercial purpose. That been the case, choosing 2019's best tool to encrypt and export iPhone videos is your NO.1 choice. 100% clean & green, support up to iOS 11. 5. Is Your iPhone Video SAFE on SNS, over the Cloud, or on iPhone iPad? As is stipulated in the majority of video tool's terms of service, your personal data: including email, contacts, personal videos, etc are 100% safe when you upload them either to share with friends or for personal use. So why you'll need to encrypt & export iPhone videos? 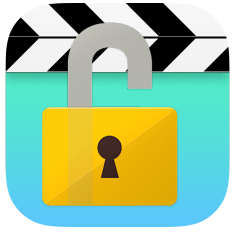 Should you backup iPhone videos with encryption to guarantee them complete security? How to export iPhone videos with encryption? Although most APP developers abide by their strict user-data protecting services, it's really difficult to guarantee 100% security in case of hacker attacks or high-profit targeted-marketing measures. How to Encrypt iPhone Videos with on Windows/Mac? You'd better consider DearMob's iPhone video encryption software – DearMob iPhone Manager – to export iPhone videos to computer/Mac with encryption. 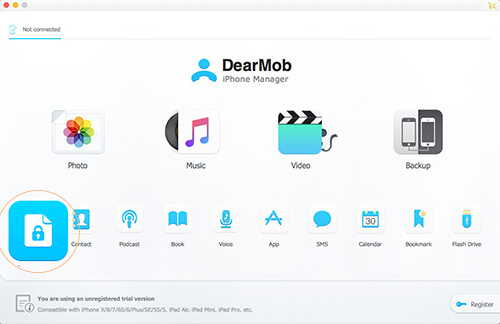 Step 1: Download DearMob iPhone Manager for Windows/Mac, install and launch it. Step 2:On the bottom-left corner, find the "File Security" tab which can take you to password protect iPhone videos, hence export iPhone videos with encryption. 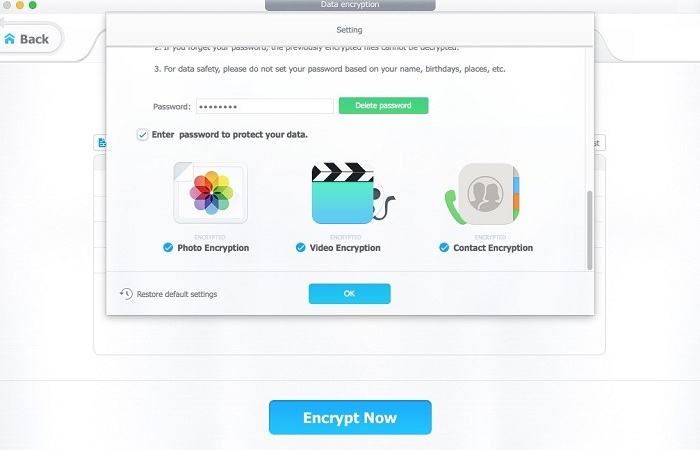 Step 3: If this is the first time that to encryption an iPhone video with password, DearMob iPhone Manager will prompt to you a password-setting windows, where you can set a keychain containing uppercase & lowercase encryption code, to follow, enable encryption for videos, photos and contacts. Step 4: Now that you've enabled the encryption utility for DearMob iPhone Manager, exit the password-setting Window, USB-connect your iPhone to computer/Mac. Step 5: Click on the video tab to enter, choose the videos you'd like to export from iPhone to computer after making sure that the "encryption" box is checked. Step 6: Check and export iPhone videos with encryption, and click on "Sync" to export them all. How to Encrypt Videos on Computer or Mac with DearMob iPhone Manager? DearMob iPhone Manager provides more than iOS video export with encryption: Should you need to encrypt local video files in MP4 MKV MOV with encryption, you may go without hassle. Step 1: If you've set up a keychain for video encryption with DearMob, you may go ahead and make sure you don't forget the password. However, if this is your first time using DearMob iPhone Manager to encrypt videos on computer/Mac, you'll need to create a passcode including uppercase + lowercase letters. Step 2:Launch DearMob iPhone Manager on your Windows or Mac. Should you need to encrypt local videos only, you won't need to USB-connect iPhone to computer. Step 3:Now click on "data security" to encrypt videos on computer/Mac. 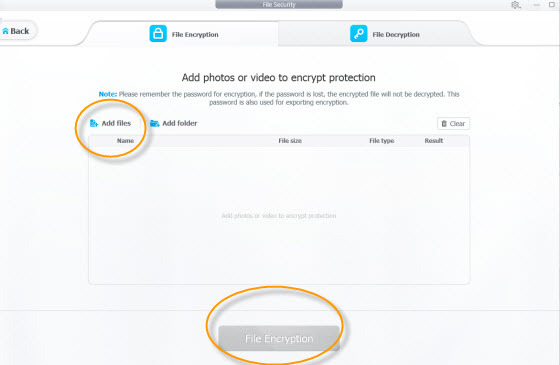 Step 4:Click on "Add Files" to encrypt one or several iPhone videos, or "Add Folder" to encrypt a full folder of iPhone videos. Advantages of iPhone Video Encryption with DearMob! iPhone data encryption was first introduced by iTunes with its encrypted backup utility, well suitable if your computer is licensed for private use only – when iTunes is powered by AES + RSA data encryption technology, DearMob's iPhone data encryption tool has discovered a much more useful method: Every user of DearMob iPhone Manager adopts a combination of: 1024-bit RSA (asymmetric encryption) + 256-bit AES (symmetrical encryption) + PBKDF2 + Argon 2, way more complex than iTunes logic of data encryption. If data security is your serious concern, you may consider using DearMob iPhone Manager to export iPhone videos with encryption, or encrypt & export iPhone contacts and iPhone photos.